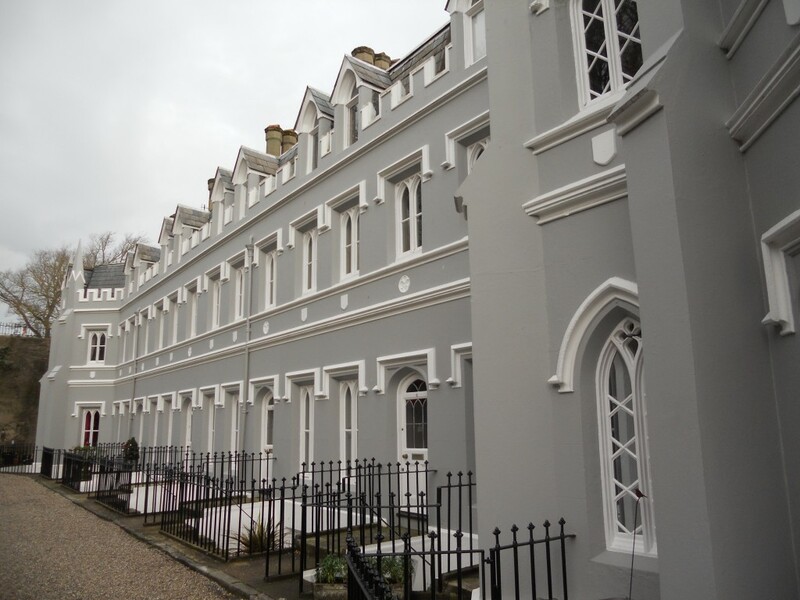 There are several examples of Regency Gothic in Brighton & Hove of which Wykeham Terrace is no doubt the finest. Its residents are worried though. Behind the thirteen houses of Wykeham Terrace is situated the west side of Queen Square, that dreadful cul-de-sac between the Clock Tower and Churchill Square where taxis queue to pass through what seems to be Brighton’s most confusing set of traffic lights. I well recall the ice rink at the top of Queen Square. The 60ft by 40ft rink was a little cosy at time but certainly enjoyable. I last skated there around twelve years ago and got soaked when I fell over in the water that should have been ice. Prior to the opening of the ice rink in 1970, the rather drab building served as a Territorial Army drill hall. Queen Square currently looks odd – characterless actually – without a focal point at its northern end. The derelict ice rink is squat and featureless after all. A taller building at the top would be most acceptable, desirable even. A planning application has been submitted for a replacement structure by the reputable local architect Paul Zara of Conran & Partners on behalf of The Light Brighton LLP. The concerns of residents about the architectural elements of the proposed are exacerbated by their unease over the intended occupier. The Light Boutique ApartHotel in Manchester offers 46 so-called ‘apartments’ for business travellers, families and party-goers – and terraces with hot-tubs and stereo systems. Such a hotel so close to the meticulously-maintained buildings of Wykeham Terrace would be a nightmare. But as long as the much smaller Brighton offshoot takes the most desirable elements of the Manchester tower, it could become an asset. There is strong opposition though so here is my alternative. The new building should be no taller than the existing houses of Queen Square and the logical building line at their rear should be embraced so that the hotel is set back from Wykeham Terrace. 11 Queen Square should be refurbished rather than demolished. There should certainly be no outdoor tubs or sound systems, especially with St Nicholas’ Churchyard so close. Whilst I am keen to see much of what is planned toned down, I would like to see the proposed bland façade given a radical overhaul. I’ve seen The Light and I’m not afraid. The residents of Wykeham Terrace will take a little more convincing. Before even the foundation stone was laid, this building was making the history books. £825,000 (somewhere in the region of £30 million in today’s money) of the £1 million was raised in 1925 from a five-course Masonic banquet for 7,250 men with 1,600 waiters and waitresses in Olympia, London. It must have been quite a spectacle. That lunch, with a staggering 15 miles of table, still stands as Europe’s largest ever sit-down meal. 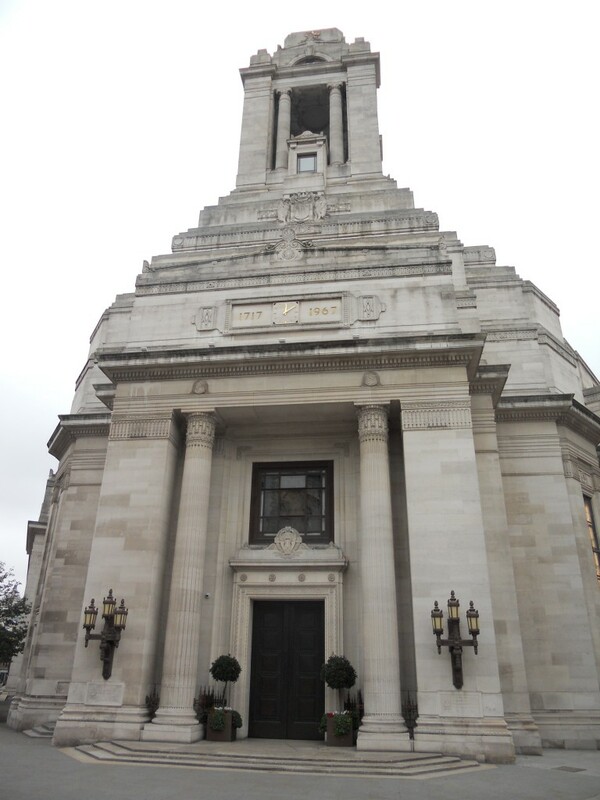 H. V. Ashley and Winton Newman were chosen to design the new Freemasons’ Hall, the third such building on the site on Great Queen Street in Covent Garden. Construction began when the foundation stone was laid in 1927 and finished when the building was consecrated in 1933. The steel-framed Art Deco structure was initially known as the Masonic Peace Memorial but it became Freemasons’ Hall at the outbreak of the Second World War in 1939. My expert tour guide told me that Freemasons’ Hall was the first building in London to have a steel frame; the first to have electric elevators; and, indeed, the first to have electricity. It feels remarkably solid and so it should with 1,600 tonnes of steel and who knows how much Italian marble. I can’t recommend a tour enough. It is open most days to the public. The largest room is the Grand Temple which is the meeting place of Grand Lodge. 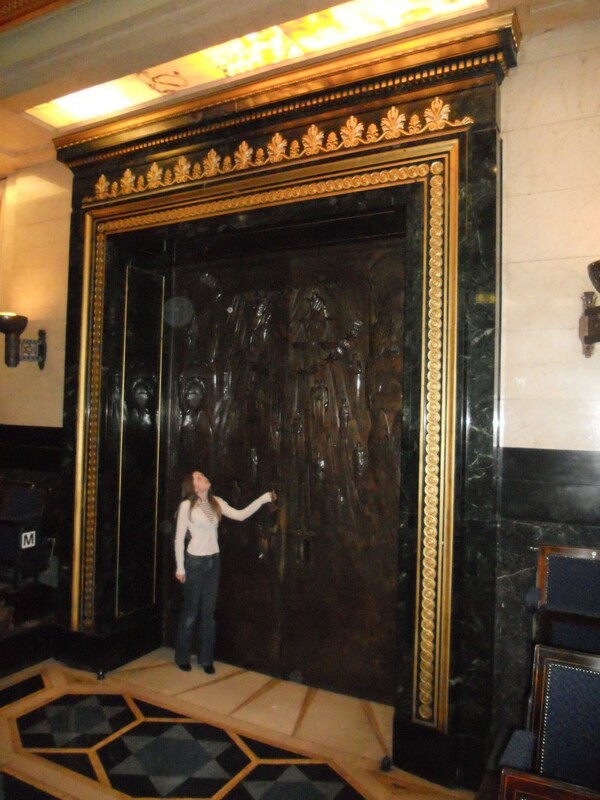 A pair of huge bronze doors is perhaps its most famous feature. Each is 12ft high, 4ft wide and 3½” thick, and each weighs 1¼ tonnes. They are so finely balanced that they can be opened with a slight push with a single finger. It is certainly fortunate that their removal for maintenance has never been necessary. Nobody actually knows how to remove them after all. Anybody who has visited the Masonic Centre on Queen’s Road in Brighton should know that it is undoubtedly the town’s finest Art Deco structure. Likewise, Freemasons’ Hall in London is without doubt that city’s finest Art Deco edifice – perhaps the country’s. Each time that I return to the University of Sussex, I get the distinct impression that Sir Basil Spence may well be Brighton’s most under-appreciated man. Most Sussex students are unaware of his work and most of those that do notice simply write him off as another insensitive Brutalist brute. One person who does love Sir Basil is campus-based art historian Alexandra Loske-Page. Alexandra recently introduced me properly to the freshly-painted Meeting House, a multi-faith building with a heavenly interior. I am not sure who sanctioned the painting of this university building though, but it does appear to be a schoolboy error. Exterior concrete, or brick for that matter, should never be painted, especially when it belongs to a Grade II* listed structure. Painting aside, the exterior of the building is in good shape. Its gargoyle-like gulley outlets direct rain away from the copper roof and into the moat below. Aluminium windows have a bad reputation but this is probably because many were used inappropriately as replacements on Victorian buildings. In the right setting, such as this, their clean lines are most apt. On the subject of clean, what should be a welcoming entrance is littered by (literally) and with (metaphorically) scruffy smokers. This is sad but it at least provides some contrast to what comes next. 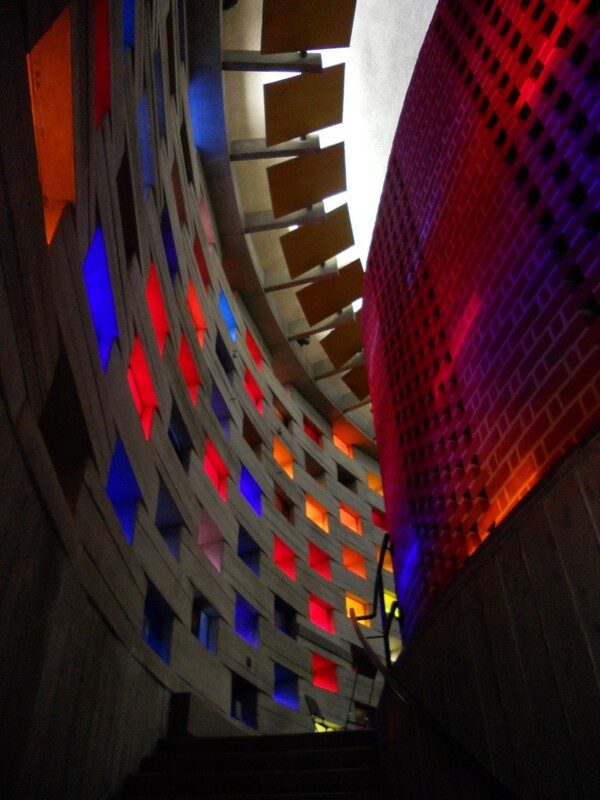 Upon climbing either of the two curved flights of steps within the lobby, visitors are deluged with coloured light from the many different panes of glass that occupy the spaces between the concrete blocks from which the building is constructed. There is a real mix of colours which vaguely divide up as red and orange in the west, yellow in the north, and green and blue in the east. The upstairs room is huge and has to be seen to be believed. 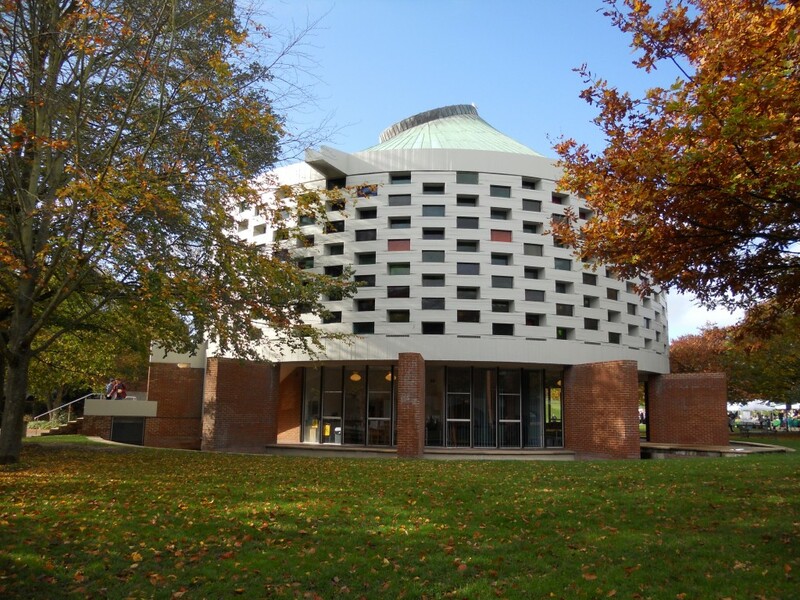 The Meeting House opened in October 1966 on the site of Tenantlain Barn at a time when campus was still rather barren. With an oast house-like exterior and a dovecote-like interior, its rural roots are not forgotten. I knew when I was studying at Sussex that I didn’t understand the architectural merit of the buildings around me but, thinking back, I didn’t really care. 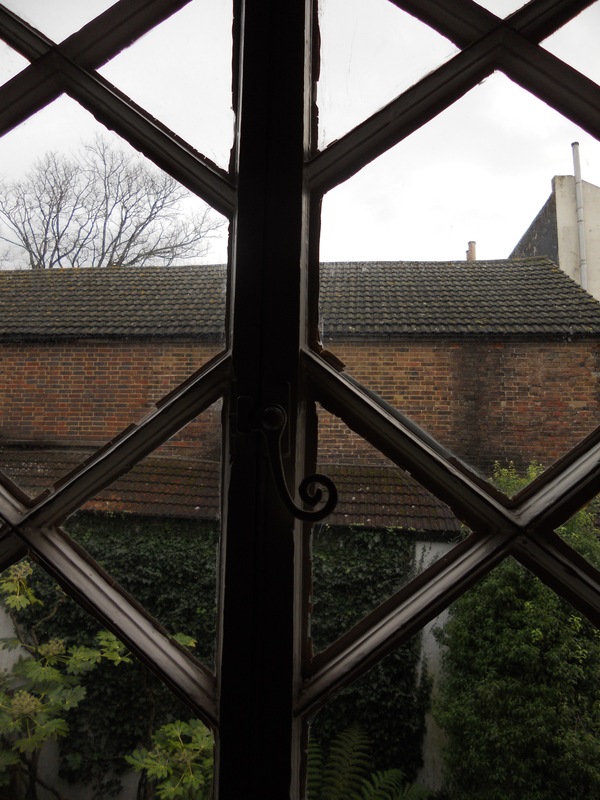 I mainly recall being frustrated that the moat within the Falmer House courtyard was empty (it still is). Since leaving, I have been getting to know and appreciate Spence’s work. Alexandra calls it “love at second sight”.